Summary: In Depression-era Key West, Mariella Bennet, the daughter of an American fisherman and a Cuban woman, knows hunger. Her struggle to support her family following her father’s death leads her to a bar and bordello, where she bets on a risky boxing match...and attracts the interest of two men: world-famous writer, Ernest Hemingway, and Gavin Murray, one of the WWI veterans who are laboring to build the Overseas Highway. It probably sounds like I am rubbing it in to those of you who weren't in attendance at the 2012 BEA, but, there really were so many books that captured my interest. One that I was thrilled to find in the goodie bag from the Penguin Bash was HEMINGWAY'S GIRL by Erika Robuck. Some of you might remember that I reviewed and loved THE PARIS WIFE by Paula McLain last year, and ever since that book, I've found that I'm extremely interested in Ernest Hemingway's life. I was very anxious to read another account (albeit a fictional one) of this fascinating man and his relationships with women. 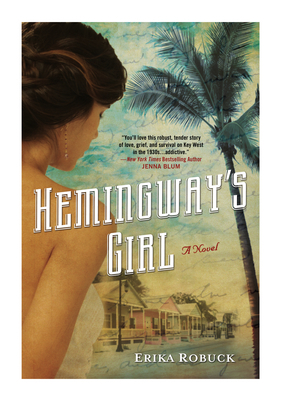 HEMINGWAY'S GIRL tells the story of Mariella, a young woman who was struggling to support her family after the death of her father in Key West in the mid 1930s. Mariella liked to live on the edge in many ways and she frequented bars and other questionable (and certainly not very lady-like) places. She also had a habit of betting her meager wages on boxing matches to make ends meet. It was at one of these boxing matches that Mariella met Ernest Hemingway and also a WWI veteran named Gavin. Mariella is immediately attracted to both men (even though Hemingway should be off-limits since he is married), and she finds herself very conflicted about her feelings. On one hand, Mariella is drawn to Hemingway because of his upscale lifestyle and his flirtations; however, on the other hand, she knows Gavin is a good guy who shares many of her dreams. As Mariella finds herself spending more and more time with Hemingway (especially when she is working full-time as the family's maid), she realizes that she has to pick the one man who will bring her the most happiness. I have to say that I thoroughly enjoyed HEMINGWAY'S GIRL! The story was extremely interesting, as were the characters; and I think Ms. Robuck did a wonderful job of bringing not only Ernest Hemingway to life but also Key West in the 1930s. I was riveted to the story and enjoyed the love triangle, and I actually found myself becoming very attached to Mariella and her family. One of my very favorite things about HEMINGWAY's GIRL was the character of Mariella. I loved how complex she was -- torn between her passions and her loyalty to her family; and I was very impressed with how authentic Ms. Robuck made her. She was a young woman on the brink of adulthood and probably had to grow up way too fast; however, she also still had a sense of naivete about her that made her very likable. I enjoyed getting a glimpse into her love "affairs" with both Hemingway and Gavin, and I most definitely appreciated how her relationship with Hemingway showed him a different (and often times kinder) light. I also liked the way that the entire story was presented. The novel actually begins in the early 1960s with Mariella and her son on a boat. She references the boy's father, and the reader actually isn't quite sure if it is Hemingway or someone else. The story than flashes back to the mid 1930s prior to Mariella meeting either Hemingway or Gavin, and it takes off from there. In many ways, the question of who is Mariella's son's father is a type of mystery; and the answer isn't revealed until much later in the story. Another really wonderful thing about HEMINGWAY'S GIRL was all of the historical information that the author included. It was very apparent to me that not only did Ms. Robuck conduct a huge amount of research prior to writing this story, but that she also had a passion for the subject matter. I enjoyed her depiction of Hemingway, and I did appreciate seeing more sides of him than just the bitter alcoholic writer (although he definitely was that too!) In addition, I like that she tackled the devastating hurricane that hit Key West. I found much of the information about the storm to be very interesting, but I did feel like the pacing of the hurricane scenes were much faster than the rest of the book (maybe that was on purpose to give the reader a sense of urgency?) However, the historical elements that I enjoyed the most were the ones surrounding the treatment of the WWI veterans after they returned home from the war. I had no idea about the work camps or the issues with alcoholism that they faced. It was such a sad part of our history but one that I am glad I now know. You really should consider HEMINGWAY'S GIRL for your next book club selection. Not only will your group have the opportunity to learn a little more about Hemingway and Depression-era Key West, but I'm assuming that they will also find a great deal to discuss about Mariella and her relationships. The author has posted a fantastic reading guide on her website (it's also available in the back of the book!) which will certainly help to generate discussion. Some of the topics you might want to explore include ethics, moral ambiguity, love, parent/child relationships, commitment, sacrifice, grief, and the treatment of returning veterans. I also think many will enjoy discussing the very complex Hemingway! Overall, I enjoyed HEMINGWAY'S GIRL for both the storyline as well as the historical elements. Definitely recommended to fans of historical fiction. I also got to meet this author at SIBA. I can't wait to have time to read the book! I'm not surprised to see that WWI vets struggled with alcoholism but I had no idea they were sent to work camps. I love to read about that time period so this sounds good to me! Thanks for the great review! I haven't yet read 'The Paris Wife' but I plan to. I'll be adding this one to my list, too! So far I've read only good reviews about this one. And I really want to read it! Hemingway was a fascinating person and I think he still continues to enthrall. I sooooooooooo regret passing on this one for review -- I've seen nothing but good things about it! I met her too at SIBA...such a nice woman! Even without all the glowing reviews, I want to read it just because she seems like such an interesting person. I met the author at BEA and thought she was so friendly and nice. :) I can't wait to read this--I just need to find the time. Review: I Love Cinnamon Rolls!